Texas hold ’em poker is easy to learn and to play. It’s an extremely sociable game that is conducive to conversation and getting to know your fellow players. From two to ten players can play Texas hold ’em poker. The first two players to the left of the dealer are the small and big blinds, respectively. They must post blinds, or forced bets; this ensures there’s always money in the pot and forces action every hand. As the dealer button moves clockwise after each hand, so will the small and big blinds. The value of the blinds varies depending on whether it’s a limit game (the amount of each bet is pre-determined) or no-limit game (players can risk any amount of money at any time when it’s their turn to bet). For example, in a 2-4 limit game, the small blind would post one dollar and the big blind would post two dollars. In a 1-3 no limit game, the small blind would post one dollar and the big blind would post three dollars. Each person at the table is dealt two “hole” cards. The first person to the left of the big blind starts the action. That player can call (match the amount of the large blind); fold (throw in, or “muck” the cards at no cost); or raise (in limit games, twice the amount of the big blind; in no limit, any amount as long as it’s at least double the amount of the big blind). Action continues the same for each player until the big blind is reached. As with the other players, the big blind may check or raise, or fold if there has been a raise. Betting occurs after each round. In 2-4 limit poker, for instance, all bets pre-flop and post-flop are in increments of two dollars; bets after the turn and the river are in increments of four dollars. In no-limit poker, bets can be waged in any amount pre-flop as long as they are at least double the big blind. In successive rounds, the minimum raise is the size of the last bet. If a player bets $10, the minimum raise is $10, for a total bet of $20. After the flop, turn, and river, players also have the option of checking; this passes the action to the next player. If a succeeding player bets, however, the person who checked must call, fold, or raise. The object is to make the best five-card hand using one or both hole cards with the community cards. On rare occasions, players don’t have to use either hole cards, using only the five community cards; this is known as playing the board. Royal flush: the Ace, King, Queen, Jack and Ten of a single suit. Straight flush: Five consecutive cards of a single suit. Four of a kind: Four cards of any rank. Full house: Three cards of one rank, two cards of another rank . Three of a kind: Three cards of any rank. One pair: Two cards of any rank. High Card: The highest card still in action. Remember, Aces are the highest rank of cards, and Deuces are the lowest; three Aces beats three Deuces every time. Here’s a few tips – If you are new to Texas hold ’em poker, it is best to only play premium hands such as: High pairs of Aces, Kings, Queens, Jacks, and Tens. Premiums cards (Ace-King-Queen-Jack-10) adjacent to each other in rank and of the same suit, or unsuited, are also great hands to begin with pre-flop as is any pair 2 through 9. Most importantly, enjoy the game. 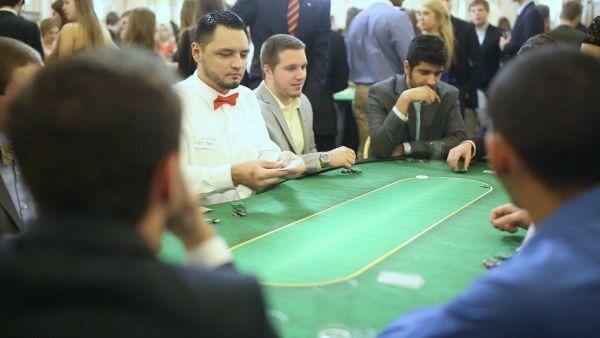 By talking to your poker “neighbors” and paying attention to the action, you can not only learn the intricacies of Texas hold ’em poker, but will also have a good time. Rege Behe is a freelance writer and journalist from Pittsburgh.